The Jewish celebration of Passover starts at sunset today (April 3) and continues until nightfall Saturday, April 11, this year. We at SPIB want to wish all of our Jewish friends and readers Chag Sameach during this celebration of God’s deliverance of the Jewish people from slavery in Egypt. Passover coincides with the Christian celebration of Easter this year. So this is a holy weekend for both Christians and Jews. Also coinciding with Passover this weekend is the third of a tetrad of total lunar eclipses occurring on Passover and Sukkot of both 2014 and 2015. These are known as “blood moons” because of the scattered rays of red light from the sun that they reflect as they pass through the Earth’s shadow. A video explaining the phenomenon can be found here. Tetrads of blood moons that coincide with Jewish holidays have only occurred 10 times since the first century, and none occurred during the previous 2000 years. Each of these tetrads has coincided with historical events of great significance for the Jewish people, and in some cases, for Christians as well. This article discusses the historical events that occurred in close proximity to blood moon tetrads. The 2014-2015 tetrad, which coincide with Passover and Sukkot both years, will be the last to coincide with Jewish holidays for the next 568 years. The last 3 of these historical events are the ones most often mentioned. The tetrad from 1492 to 1493 occurred in the same time frame as the expulsion of Jews from Spain by Queen Isabella and the launch of Christopher Columbus’ expedition that would discover a new land in which Jews would find refuge centuries later. There was a tetrad of blood moons in 1949-1950, during which the Jewish state was established and during which the Arab-Israeli War for Independence occurred. A tetrad of blood moons also coincided with the Six-Day War in 1967, when Jerusalem was liberated and additional Jewish land reclaimed. Since the occurrence of tetrads of blood moons that coincided with Jewish holidays has historically been primarily in the same time frame as war or persecution for the Jews, the tetrad from 2014 to 2015 has generated a lot of interest and concern. This is especially true considering the pressures that have come to bear against Israel from the Obama administration and others in the international community. Image retrieved from Breaking Israel News. 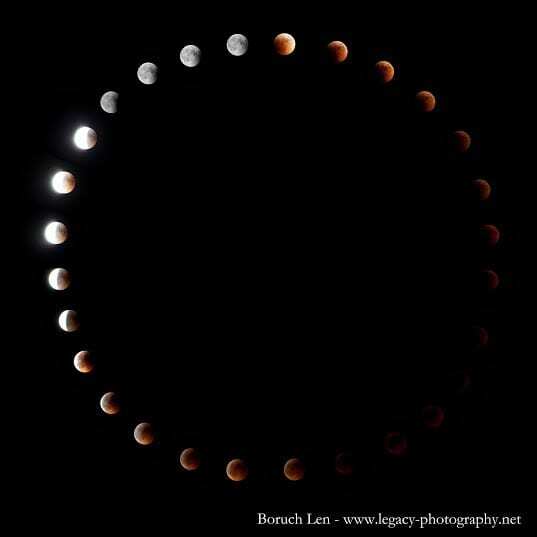 Cycle of the Blood Moon. 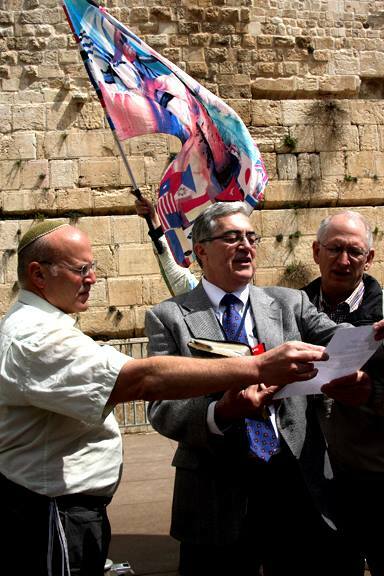 “Bob and I were influenced by the rarity of this coming Blood Moon – the shortest lunar eclipse ever recorded in human history on the night of Passover, and the fourth shortest of all eclipses in the last 4,000 years,” Biltz told Breaking Israel News. The imminent total lunar eclipse, known as a Blood Moon, will take place on the fourth day of the fourth month, April 4th, and will last for exactly four minutes and forty four seconds. “Iran’s impending nuclear threat in the region has Israel very concerned. So we believe it is both important and urgent that Christians everywhere pray for the peace of Jerusalem on 4/4 for just 4 minutes and 44 seconds,” explained Biltz. Biltz and O’Dell have organized a special prayer event scheduled for 11:58 AM GMT and is a response to a similar call issued two weeks ago by Ariel. For the corresponding time in your area, click here. Ariel, an Orthodox Jew, called on Jews and Christians to pray together on behalf of the entire world, during the two minute long shadow over the North Pole during the recent solar eclipse on March 20. Ariel explained the reason for the two calls to prayer. The recent outpouring of interest in the Blood Moons has been covered widely by mainstream media such as Fox News and the Washington Post. Pro-Israel Pastor John Hagee released a documentary last week entitled “Four Blood Moons”, which sparked another round of interest. 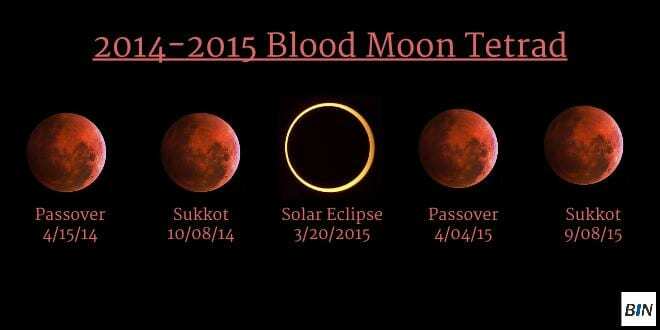 For optimal viewing times of the Passover 2015 Blood Moon around the world, click here. Two weeks before Passover, on March 20, there was a total eclipse of the sun over the North Pole on the first day of Nissan. This happens every 100,000 years and is therefore the only such occurrence in human history. 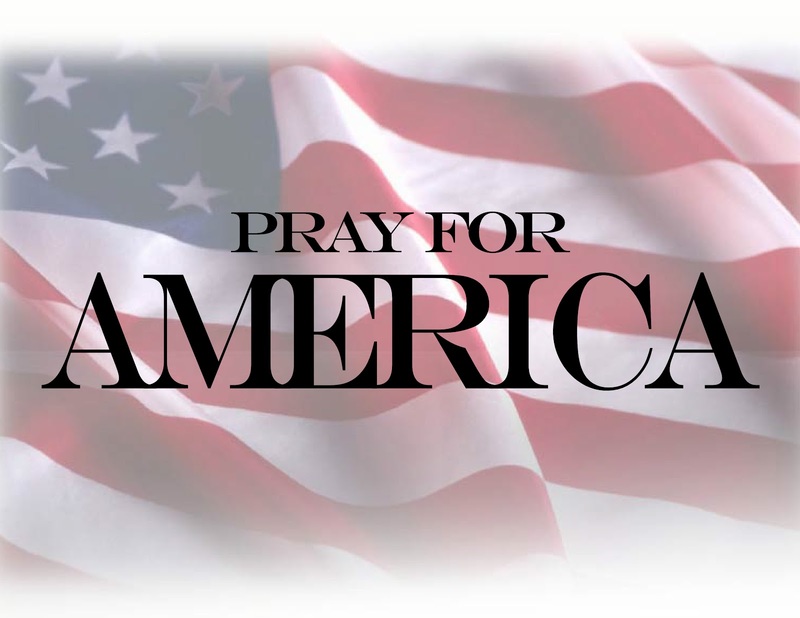 That prompted the global call to prayer mentioned in the article above. Breaking Israel News has links to additional information about the Blood Moons and local time for the Pray for the Peace of Jerusalem event on Saturday here. You can also find out if Saturday morning’s lunar eclipse will be visible in your area and at what time it will be at its maximum here. Video retrieved from CBN News. SAN ANTONIO — The Book of Genesis says God uses the sun, moon, and stars for signs and seasons. Examples can be found throughout the Bible. Think of how a star led the wise men to Jesus or how the sun stood still as Joshua led Israel to victory over its enemies. According to Pastor John Hagee, God is getting ready to speak this way once again. Blood moons are set to appear in April 2014, on Passover, and then again in October 2014 during the Feast of Tabernacles, or Sukkot. “The sun and the moon and the Earth are controlled by God almighty,” Hagee said. “He is the one that is getting them in a direct alignment on a certain day at a certain time — but each time, it’s a Passover or Sukkot. “In each of these blood moons, you have something that begins in tragedy and ends in triumph,” Hagee explained. For instance, in 1948, Israel was reborn as a nation. In 1967, Israel won the Six-Day War and recaptured Jerusalem. Then, there are continued attempts by the world to strike a deal with Iran, which promise to only increase in 2015. “The only reason that Iran will not acquire a nuclear bomb will be that Israel chooses a military solution to that crisis,” Hagee told CBN News. He said it’s still unclear what the coming blood moons will bring, but he is certain of one thing. For additional tweets from Root Source, go here.